Make the cake layers a day ahead of time (if time allows) and wrap well in plastic wrap. This will improve the texture of the cake and the waffles will become soft. If your oven has a tendency to over-brown, place a sheet of aluminum foil over the cake pans to protect the waffles. Preheat the oven to 350 degrees. Grease and flour three 8-inch round cake pans, or spray them with flour-based baking spray. In the bowl of an electric mixer fitted with the paddle attachment, beat the butter and brown sugar together until well combined. Beat in the maple syrup. Add the eggs one at a time, beating well after each addition. In a large bowl, sift together the flour, baking powder, and salt. Add the flour mixture to the butter mixture, and beat to combine. Add the buttermilk and vanilla extract and mix until combined. Divide batter between the three prepared pans. Center a Belgian waffle in the batter in each pan; press it down into the batter slightly. Bake until golden and a cake tester inserted into the centers comes out clean, about 20 to 25 minutes. 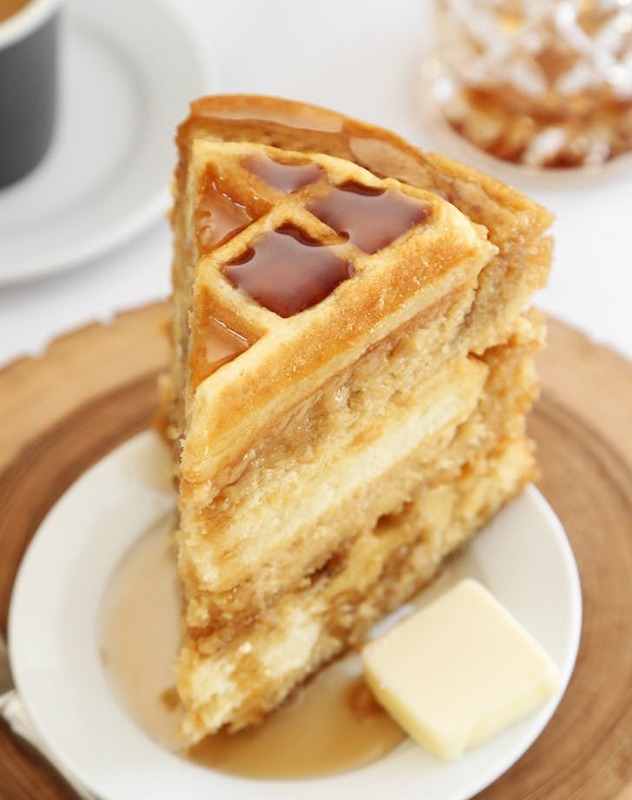 Cover the cake pans with aluminum foil halfway through baking if the waffles begin to over-brown. When done, transfer pans to a wire rack to cool. Place one cake layer on a serving plate. Cover the cake with 1/4 cup pancake syrup. Add a second layer and repeat; top with the final layer and pour the remaining syrup on top. Place pat of butter in the center of the top layer. Store covered in plastic wrap.